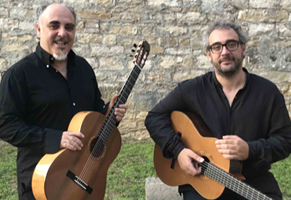 Duo Lazzeri-Leonardini “LL” was formed in 2016 by Italian guitarists Sandro Lazzeri and Emiliano Leonardi. Sandro Lazzeri was born in Sardinia, Italy. He graduated from the “Francesco Morlacchi” Conservatory of Perugia in classical guitar performance in 1988 under the guidance of M° Claudio de Angelis and studied in masterclasses with illustrious guitarists, such as David Russell, Leo Brouwer, Alirio Diaz, Hubert Kappel and Costas Cotsiolis. He performed an intense concert activity as a soloist and in various chamber formations (such as duos with flute, violin, and voice; duo, trio and quartet of guitars; guitar and string quartet; trio with flute and clarinet; guitar and orchestra; guitar and choir). He has been invited frequently as a guest for important concert associations in Italy, Germany, France, England, Greece, Albania, Switzerland, Spain, Austria, U.S.A. and Ireland. He has been praised by the public as well as critics for his interpretations of a wide range of guitar repertoire. In 2002, he founded the “Alvarez Guitar Quartet”, which has been presenting frequent concerts and releasing video and audio recordings. Since 2012, he is the artistic Director of the “Umbria Guitar Festival”, that hosts international musicians from all over the world. In 2009 in collaboration with the actor Luca Tironzelli and the director Luciano Falcinelli he has toured with the project “Platero y yo” with the music of Eduardo Sainz de la Maza on lyrics by J. Ramon Jimenez throughout Europe and the United States. He released a CD with the music of Spanish composer Eduardo Sainz de la Maza in 2014 and another CD “Palhaco” with the works by Brazilian composers in 2015. During the same time, he began the period of intense work with the great guitarist Flavio Cucchi, with whom he performed the premiere of “Children’s Songs” by Chick Corea, transcribed by Cucchi together with the composer. In the same year, he also performed with the “l’Odicòn Vocal Quartet”. Since 2016, he has been touring with guitarist Emiliano Leonardi, playing concerts as Duo “LL”, and together they organize the festival “Suoni dal Legno”. Besides all, he dedicates himself to the intense didactic activity of the guitar. Emiliano Leonardi was born in Arpino, Italy (FR) in 1979 and at the age of 18, he began to study classical guitar. In 2004 he graduated from the “Santa Cecilia” Conservatory of Rome under the guidance of M° Giuliano Balestra. Since 2000, he has regularly been giving concerts as a soloist, as a chamber musician in various instrumental combinations, and with orchestra throughout Spain, France, Switzerland, Czech Republic, Slovenia, and Russia. Winner of several national competitions, including “National Competition for Instrumental Execution”, Naples, “European music Competition”, Atri (TE), “Competition of musical performance Teramo Est”, Giulianova (TE), “International Competition of Ortona”, Ortona (CH), National competition “Città di Bacoli”, Naples, he was one of the finalists in the “Concorso Humaniter” that was organized for all students of Italian conservatories in 2003. He has performed in masterclasses with David Russell, Emanuele Segre, Bruno Battisti D’Amario, Massimo Delle Cese, Eugenio Becherucci and Alfonso Borghese. In 2007 he received a music pedagogy diploma from the “Licino Refice” Conservatory of Frosinone and in 2011 he graduated with an instrumental music pedagogy degree from the “Luigi Cherubini” Conservatory of Florence. In 2015 he attended the two-year specialist course at the Musical Institute of “Giulio Briccialdi”, Terni. Since 2008, he has been the artistic Director of the festival “Suoni dal Legno”,Todi (PG), hosted also the artists of pop-rock music, such as Jethro Tull, Dream Teather, Steve Hackett (ex Genesis), Tuck ‘n Patty, Gino Paoli, Michele Zarrillo, Franco Cerri. He was also the artistic Director of the “Todi Festival” from 2011–2012. Since 2016, he has been touring with guitarist Sandro Lazzeri, playing concerts as Duo “LL”.